The Red Roof Inn is available at $ 55 per night. This was one of the lowest priced hotels we found. The hotel offers the most basic facilities. It offers a smoke free building with proper air conditioning and a 24 hour reception. Apart from that, one can expect free wifi and some premium channels on television. This is pretty much what the hotel offers. If you are one of those looking for a great deal, this is a good choice. Besides being on the fairgrounds, it is not far away from Busch Gardens. This one is available at $75 per night. Located near the airport, it is a good choice for business travelers. It also has a business center and the facility of express checkouts. Also, transportation to the airport is free of cost. In case one would like to relax a bit, it has a outdoor pool. 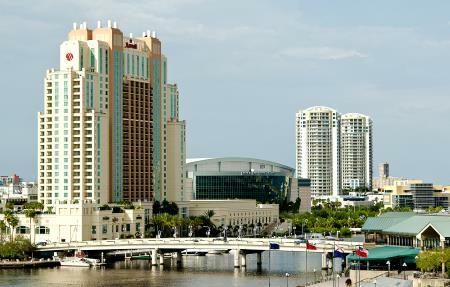 One can find the University of Tampa and the Tampa Museum of Art around 6 kilometers away. The next three hotels which we suggest are all priced at $89. They are great budget hotels in their individual right. However, they differ among themselves regarding some key features. You may choose the one which best suits you. Moving up the price ladder brings some additional benefits. The Westshore Grand boasts of concierge services and laundry. It is also the only budget hotel to offer atm and banking services. Besides the other common features, it also offers premium bedding and infant beds. All these features make it a powerful option if one is considering longer stays. Like the Laa Quinta, one can visit the University of Tampa and Tampa Museum around 6 kilometers away. The hotel differentiates itself from the pack in a number of ways. It offers fitness facilities and a complimentary breakfast. Besides it has the adventure island at a distance of just 1.6 kms. Also, it runs a complimentary shuttle to Busch gardens. Though it also has conference rooms and free newspapers, this hotel is better suited for tourists looking to get around Tampa. It may be a bit out of the way but the hotel packs in some great features. Besides a complimentary breakfast and outdoor pool, guests are given the pleasure of Barbecue grills. It also has multilingual staff for tourists who might find communication difficult. It also runs complimentary area shuttles which will help getting around much more cheaper and comfortable. Each of these hotels are really good options in their own right. It just depends on the tourist. The Red Roof works best for the no frills traveler while the La Quinta may be the best for the business traveler. Among the hotels in the $ 89 range, all are pretty unique and differentiate themselves very well. In order to have a great experience, just make sure to choose the one which is right for you! Book a party bus Tampa to take you to all the nearby theme parks and attractions Tampa has to offer.